Predictions of new plays, formations, and strategies are beginning to emerge as the season progresses. I expected to see base plays with nothing new introduced in a game of which we are highly favored, but I was surprised to see some new concepts revealed. It was refreshing to see the passing game further refined with new receivers materializing to help our offensive balance. Games like this build confidence for the tough league games ahead of us, and allow new surprises to be experimented with when a game is not on the line. 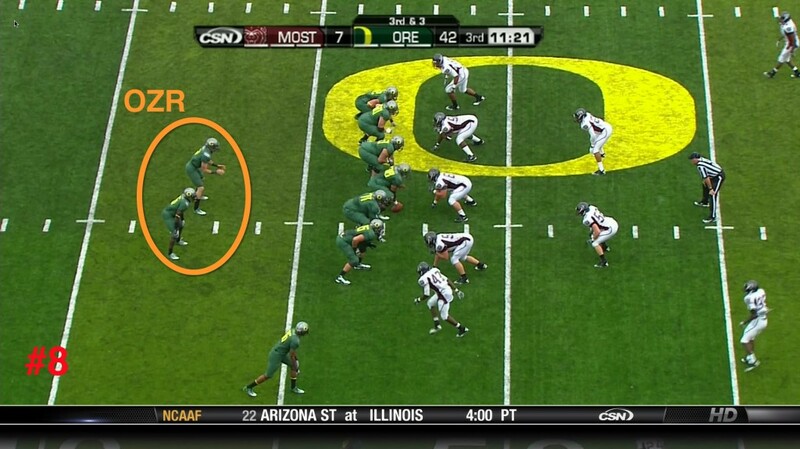 It was fun to see the “Ace” formation (Above) utilized after seeing it in the Spring Game. It takes some getting used to see Darron taking a snap behind center, yet the blocking is the same Outside Zone Read kick-steps and pulling that we’re accustomed to. In addition to the formation—we see another concept from the spring, (Above) the pulling of the center, #55 (Hroniss Grasu) to lead the RB to the corner. 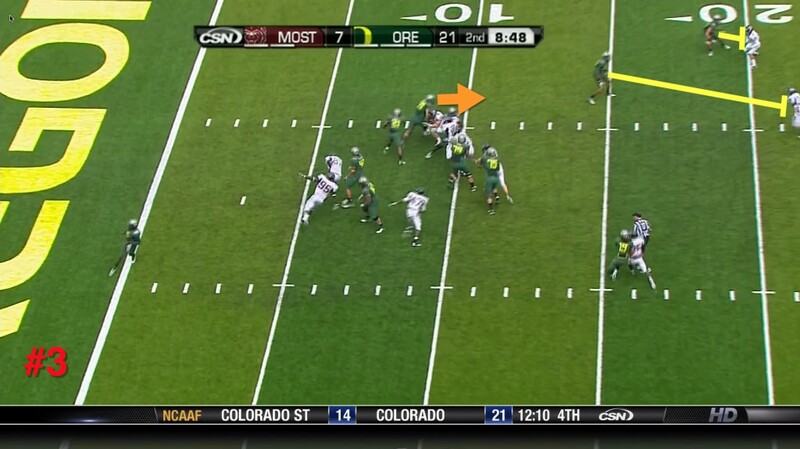 Note the tremendous seal block of the DE by David Paulson, (Red Arrow) and another sealing block on the edge by Weems. 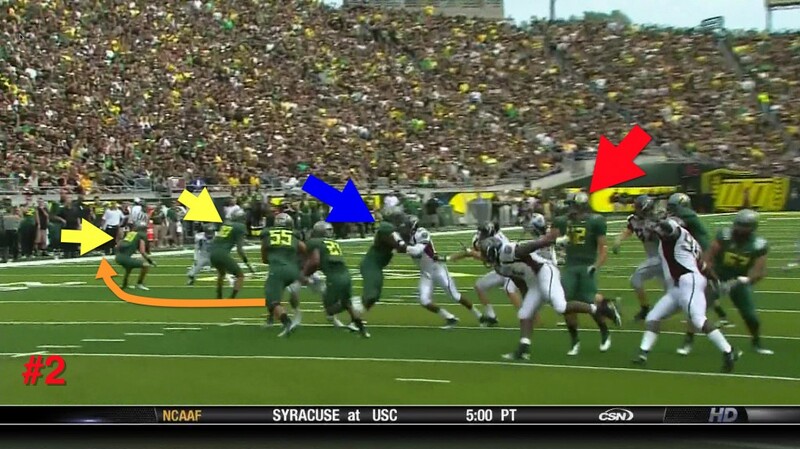 (Blue Arrow) The WRs, (Yellow Arrows) are getting set to create a corridor for LaMichael to run, as they fought hard to hold their blocks. Tuinei and Hoffman (Above) did a terrific job on this play and you see a CENTER (Orange Arrow) leading the way for a RB to the perimeter. I cannot state enough the importance of having an extra blocker out there to help spring the big explosion plays. We haven’t seen this in over two years, thus it becomes a huge new weapon for teams to adjust to! 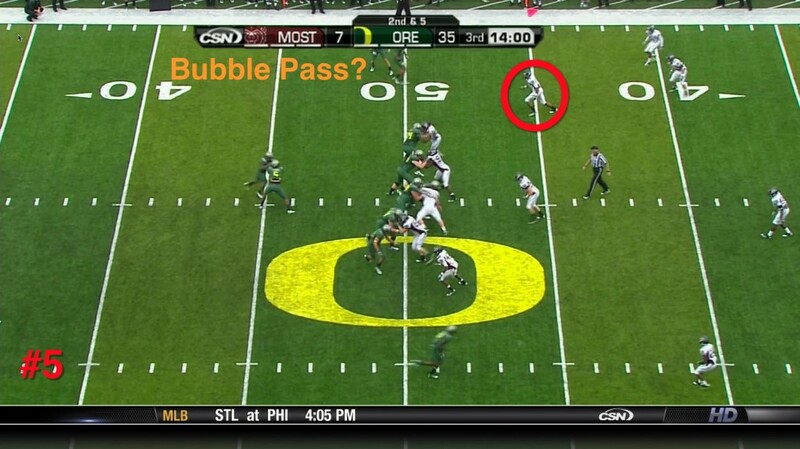 I love the Bubble Pass series of plays we have because often it is an easy 5-10 yards when completed. We are lining up in an Inside Zone Read formation, yet we threaten a Bubble Screen (Above) in the upper perimeter. The over-reaction by MSU to the Bubble Threat (See dotted red line above) has left them with one less LB to defend the Inside Zone Read, thus Thomas hands it off. We see sensational blocks by Grasu taking on the Middle Linebacker, and a gap created by Nick Cody and Mark Asper on the inside. The final block that completes a scoring play is by Rahsaan Vaughn on the safety and it’s SIX POINTS because the opponent was trying to guard the edge—which opened up the inside. We love it! 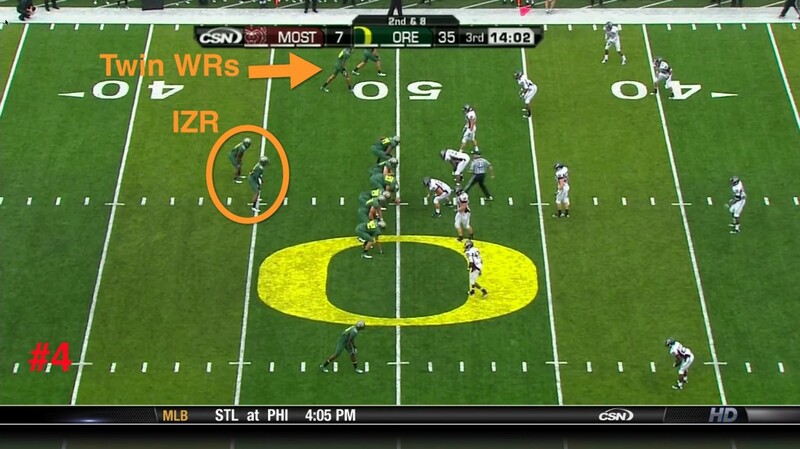 They aren’t going to let that happen again, so MSU has two-on-two coverage of the WRs at the top. (Above) As the Inside Zone Read mesh is taking place the OLB charges, while the Defensive Backs for the Bears appear to be flat-footed because we ran a new play so quickly from the No-Huddle. As you know—the result is a tremendous block by Daryle Hawkins to create a seam for Eric Dungy down the sideline scoring a similar touchdown as against Arizona in 2008. If we can get one-on-one blocking either inside or outside—we can capitalize quickly. Wow. A sharp young writer at FishDuck.com, Josh Schlichter, pointed out how we were beginning to alter the formations for plays during the LSU game. I wasn’t certain until I noted examples of precisely his descriptions in this last game. 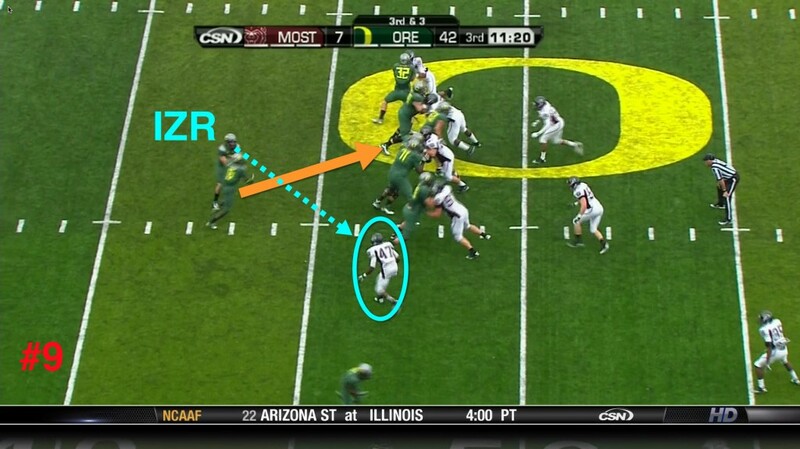 Note in the picture above how we are clearly lined up in an Outside Zone Read Play formation. 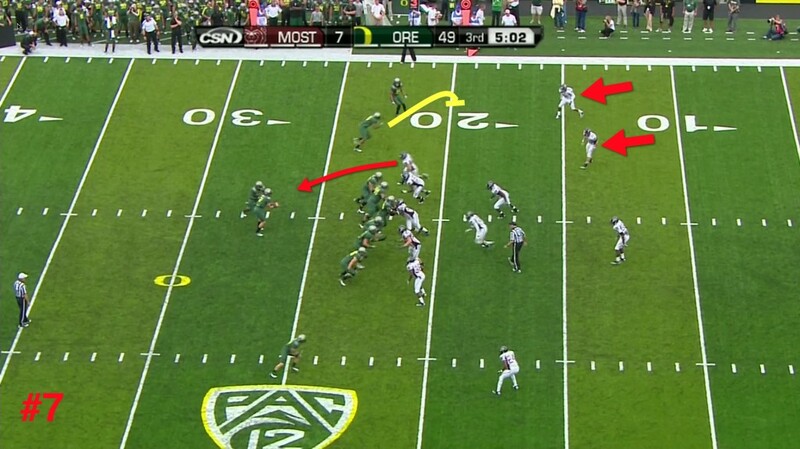 We’ve seen this hundreds of times in the last two years and it is always an Outside Zone Read play. When the play progresses, (Above) we see the Zone Reading of the Defensive End, but the blocking is NOT a kick step to the outside or pulling! It is straight ahead like an Inside Zone Read play. As the RB approaches the LOS, it becomes apparent that he WAS headed to the Inside Zone Read gap, but bounced it outside! I’ll be darned! Chip IS beginning to mix it up to confuse defenses between Zone Reading OLBs and now changing the formations with plays. Josh will be giving us video PRE-GAME analysis on Fridays of our upcoming opponents, and I look forward to learning his insights. 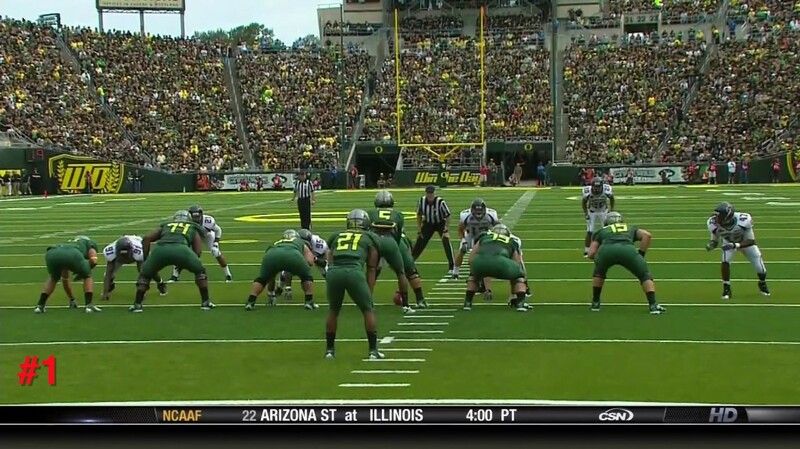 Kurt Liedtke has built the Oregon Football Highlight Video Archive (The FishTank) up to an astounding 3,000 videos. What a terrific group that has assembled at FishDuck.com! Surprises in formations and strategies are fun to discover, yet even more exciting is watching the progression, the confidence growing in players who could have a huge impact in the success of this season. I’m not sure I can recall when I saw so many freshmen arise with this much bearing on the games and the team’s direction.